Ninjutsu (忍術) sometimes used interchangeably with the modern term ninpō (忍法) is the martial art, strategy, and tactics ofunconventional warfare and guerrilla warfare as well as the art of espionage purportedly practiced by the shinobi (commonly known outside of Japan as ninja). Ninjutsu was more an art of tricks, than a martial art. Ninjutsu was a separate discipline in some traditional Japanese schools, which integrated study of more conventional martial arts along with shurikenjutsu, kenjutsu,sojutsu, bōjutsu, battlefield grappling kumi-uchi (an old form jujutsu) and others. 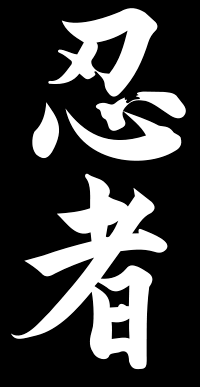 While there are several styles of modern ninjutsu, the historical lineage of these styles is disputed. Some schools and masters claim to be the only legitimate heir of the art, but ninjutsu is not centralized like modernized martial arts such as judo or karate. Togakure-ryū claims to be the oldest recorded form of ninjutsu, and claims to have survived past the 1500s.